Not too many days ago I was happily reading the Elecraft email for the day and there was mention about a new Semiconductor Analyzer that was about to come onto the market in kit form. I have always wanted something to handle the chores for me on analyzing semiconductors and I had to have one. A contact to MCubed Electronix, Inc. (http://www.m3electronix.com/ ) and Mike Doty, W0MNE, ww2742@dragonbbs.com responded. 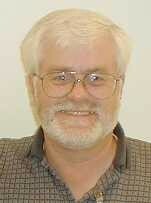 Note: the sales contact is listed as Mike Knox, KC8WR, kc8wr@bright.net. As they accept bank transfer through Pay Pal, I ordered a kit on the spot and in only a few days the box arrived. My Elecraft K2 developed the INFO 080 error not too long ago. I promised myself I would build no kits until the K2 was operational...I lied. This analyzer needed to be built right away. I am not going to go into much detail in this writeup but will add sequential photos of the kit progress. My workbench was actually already cleared off in preparation for working on the K2. The M3 kit was nicely packed and the bags of parts were quickly spread out. I did an inventory and all the parts were there. This is good. The instructions for building the kit are straight forward with little excess detail. As the kit is quite simple to build, there is no real need to go to unusual lengths in the detail. In fact, the option is there in the instructions to just plug and solder as you please but I chose to follow the instructions step by step so I could be sure to get the parts right. Also, I did decide to use my HP3478A to check the resistance of all the 1% resistors just to be sure I had the right ones in the correct spaces. The LCD readout is prebuilt and just plugs into the main board. After wiring up the battery and switch the unit was ready for testing. Testing was very simple. The three probe leads are shorted, the W1 leads are shorted, the unit is turned on, W1 is released and self calibration takes place. Done. Takes just seconds. After mounting the readout on the case, I moved on to preparing the probes. I made a mistake here. I forgot that heat guns get hot. Well, I did not forget at first. I slid the heat shrink tubing onto the leads and slid them back away from the probes. Applying heat, I reduced the size down to near the size of the wire but not quite. The heat shrink slid into the probe housing just fine and I then used the heat gun to tighten up the remaining tubing. As I was assembling the leads I notice the probe heads would come off if I just pulled on them. Ah, hah!! Now can I can heat shrink the tubing up closer to the solder joint. (I suspect you can guess where this is going. :-) ) As I applied heat, all worked great but when I tried to reassemble the probes, I found I had deformed two out of three. This is why my unit no longer looks like the one on the M3 Electronix website. (see small photo below) So once again, I relearned what I already knew from past mistakes: heat guns are hot and plastic melts. Wow!! What a surprise. It was fortunate that I found some old probes around the house along with the jacks that fit. The leads are a bit too long and the jacks are kinda large but all in all, the unit looks pretty good and it works perfectly. I did recalibrate after adding the longer probe leads just to be on the safe side. I really like this semiconductor analyzer. It is fast and gives me key parameters on many semiconductors. All I have to do is connect the three probes onto any of the three legs and the unit tells me which lead is E-B-C. The kit took me about two hours to complete and test with the box taking about another hour. There is a new Version 3.1 chip out now and folks with the original version will be able to upgrade at no cost. The new chip adds new features and enhance the exisiting ones. This is a must have piece of test gear for any ham shack. 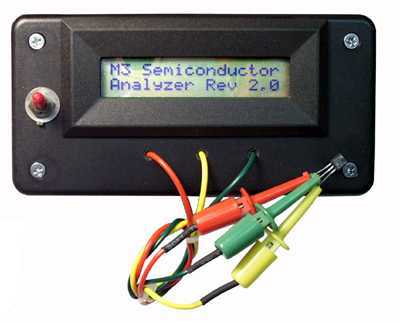 I hope you enjoyed this non technical report of the M3 Semiconductor Analyzer as seen from my workbench. It has been fun for me and I enjoy sharing with you. Maybe later I will add some of the technical information from the manual but for the price, why not just buy one for yourself. Features are found at http://www.m3electronix.com/features.html The User's Manual is also on this page.